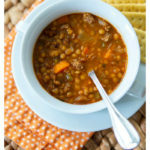 This spicy sausage and lentil soup recipe is the perfect cozy comfort food for chilly weather. 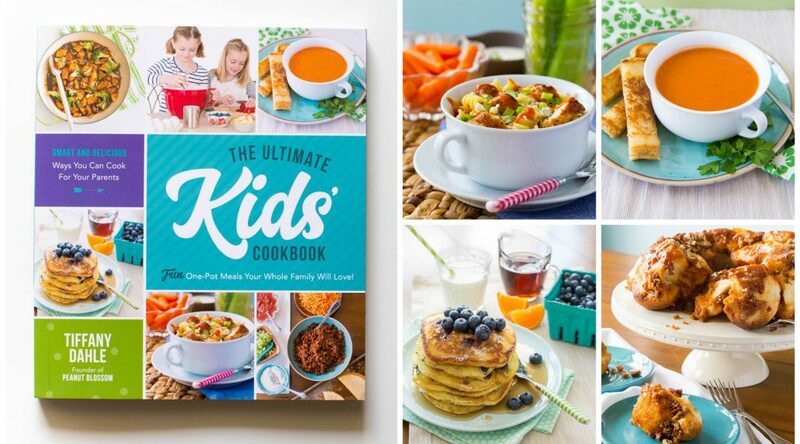 If you’ve never tried lentils before, this is a great way to introduce a delicious and healthy new food to your family. The very best recipes are the ones handed from friend to friend, don’t you think? When two guys have to spend an entire day side-by-side in a car on a work related road trip, conversation can go in crazy directions. A few weeks ago, Tim ended up chatting with a work friend about their favorite recipes their wives have made for them over the years. Skip, a wise 70 year old who knows how to make his wife smile, described the sausage and lentil soup recipe that she has made for him frequently over the years. This recipe, we’re told, is a family-wide favorite. When they got back to the office, Skip took the time to get the recipe from his wife just to share with us. Tim forwarded it to me with a note asking if we could try it soon since it sounded so good from Skip’s description. Yes, that’s right. Neither of the adults in this household had ever eaten lentils or even knew what they were. But, since Tim was obviously intrigued, I jumped at the chance to try something new. Before we tried this sausage and lentil soup recipe, our family had never given one thought to what lentils are! I was so thankful Tim sent me a link to read more about them. It turns out, lentils are mini-sized legumes that pack a big dose of nutrition. Each serving contains protein, fiber, and minerals. I personally can’t stand chili beans, so I was very relieved to discover that even though lentils are a legume, they are not a bean. Tim found this great guide written by Jessica Gavin that covers all the different types of lentils and how they vary in taste, texture, and uses. We were then encouraged to give lentils a test run. Which lentils are best for soup? I didn’t stop to consider which lentils are best for soup before heading to the grocery store for my ingredients. I selected a package of green lentils because they looked most like peas and felt comforting to me. I also thought maybe they’d be easier to get past the kids if they looked familiar. 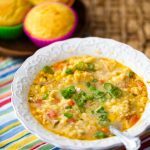 After some research, it turns out that brown, red, or yellow lentils might be a better option for soup because they split open while cooking while green lentils tend to hold their shape more. 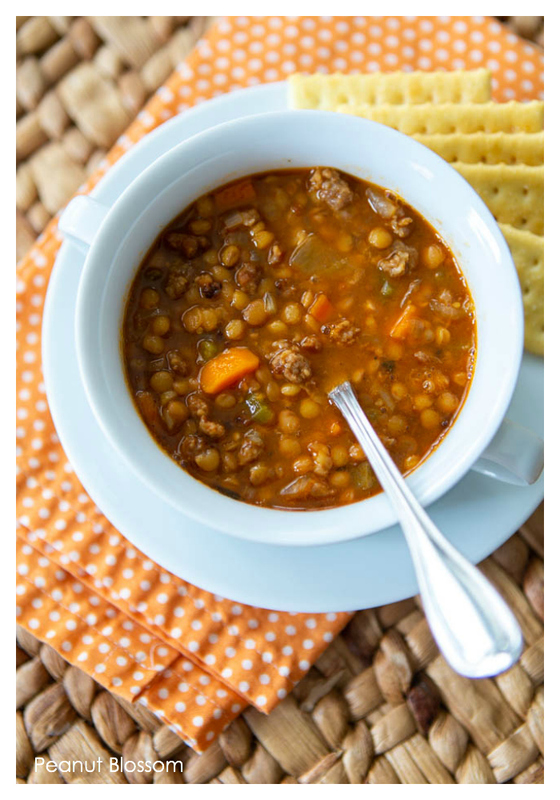 I’ve made this sausage and lentil soup recipe twice and used green lentils both times. The green lentils soften while cooking and are quite delicious. I think it likely doesn’t matter which color lentil you use for soup, just go with the one that looks the most appealing to you. The key to making this sausage lentil soup is ensuring you have enough liquid in your recipe and that you stir the soup fairly often. The lentils will thicken the broth and you want to be sure you don’t end up with a burnt section of lentils at the bottom of your pot. I kept an eye on it as it simmered and added 2 cups of water at a time whenever the soup looked like it was getting too thick. A quick stir let me know if things were starting to stick at the bottom so that I could turn the heat down or add more water. The spicy sausage is one of the kids’ favorite foods, it definitely overpowers any lentil taste. 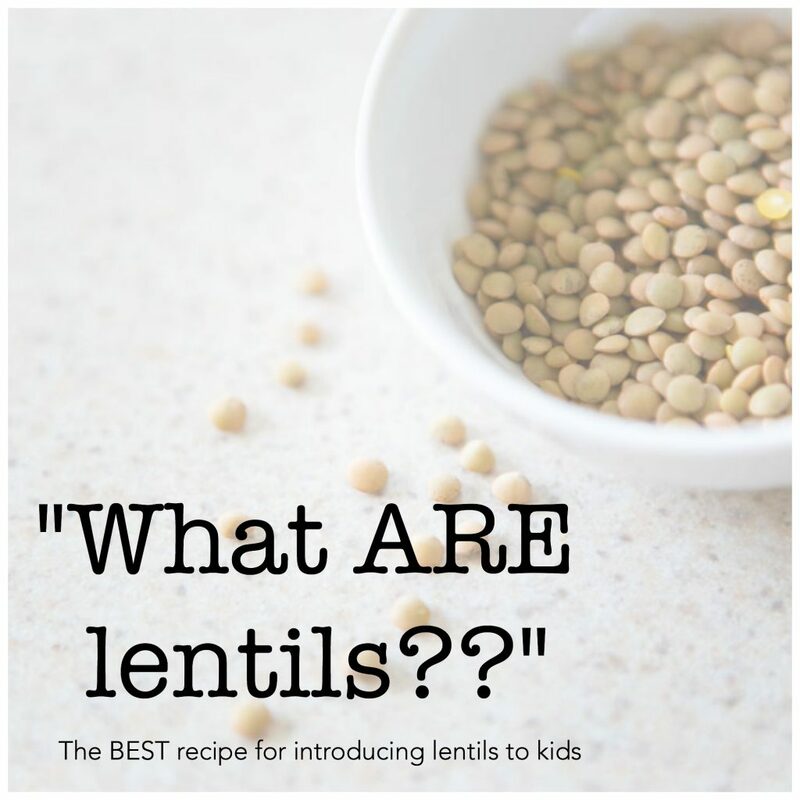 We talked about how lentils are a lot like peas, another favorite veggie in our house. I cooked the lentil soup until the lentils were very soft and had almost no additional texture. They blended right in with the small bits of sausage. I offered a delicious bread or cracker for dunking in the spicy lentil soup. My kids will eat almost anything if they can dunk a breadstick in it. I was thrilled to discover that BOTH of my kids LOVED the soup and begged me to make it again soon. It was such a hit, they pleaded with me to take it to school for their lunch in a thermos. The sausage lentil soup is a great recipe for making on a Sunday and packing up for lunches for the adults and kids all week long! This is the perfect freezer-friendly soup. It makes a huge batch that you could freeze in single-serving portions for easy lunches or in bigger portions for a quick weeknight dinner in a pinch. The soup reheats really well but if you notice it thickened too much in storage, just add a splash of water or chicken stock to rehydrate it as needed. This hot and spicy sausage and lentil soup is the perfect comfort food for chilly days. Freezer friendly, kid friendly, perfect for a big crowd with a big appetite. In a large skillet over medium-high heat, brown and crumble the bulk sausage. Break it up into small pieces as it cooks. Sauté until the sausage is nicely browned and toasted. Drain the fat and set the sausage aside. Thoroughly rinse and drain the dried lentils in a colander and set aside. In a large stock pot, heat the olive oil over medium-high heat until shimmering. Add the onions, carrots, and celery and add a sprinkle of salt & pepper. Stir to combine. Sauté the veggies until the onions are softened and translucent. Add the garlic and the seasonings to the veggie mix and stir to combine. Heat for 1 minute until fragrant. Add the tomato paste and tomato sauce, and stir to combine thoroughly with the veggies. Add the reserved sausage and lentils to the pot and stir to combine with the veggies. Pour in the chicken stock and water and stir. Bring the soup to a gentle simmer and then reduce the heat to low. Let the soup simmer for 2 hours stirring every 10 minutes or so to be sure nothing is sticking or burning on the bottom of the pot. Add 2 – 4 cups of water as needed when the broth becomes too thick. We like this soup spicy so I used 2 pounds of hot bulk sausage. To make it more kid friendly, use 1 pound hot and 1 pound sweet and go lightly with the cayenne pepper. Light chicken chili with NO BEANS!